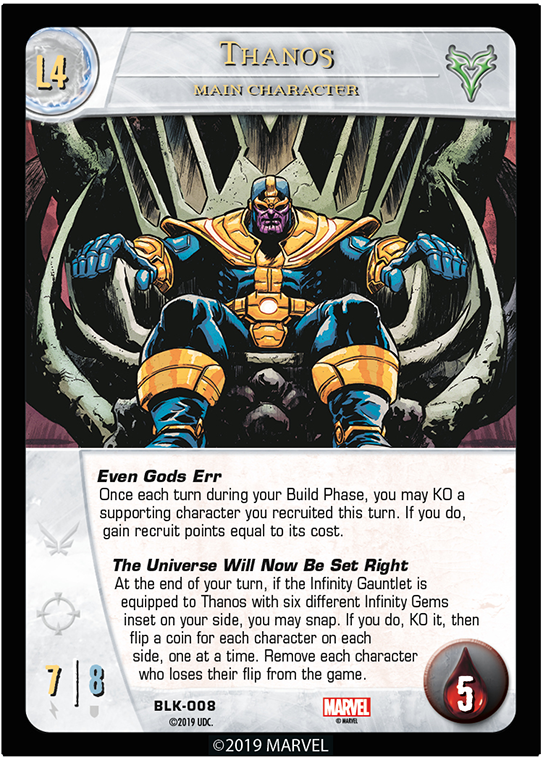 Welcome to our final preview for the Black Order Issue in the Infinity War Arc for VS. System® 2PCG®! Last time we saw some whoppers, including Death herself and the first two levels of a new Thanos Main Character! Today, I promise to reveal some of our most thematic designs ever! Let’s pick up right where we left off! Note that My Quest Begins includes all types of methods of getting cards in your hand from your deck, including drawing them, or searching for them with some other effect. 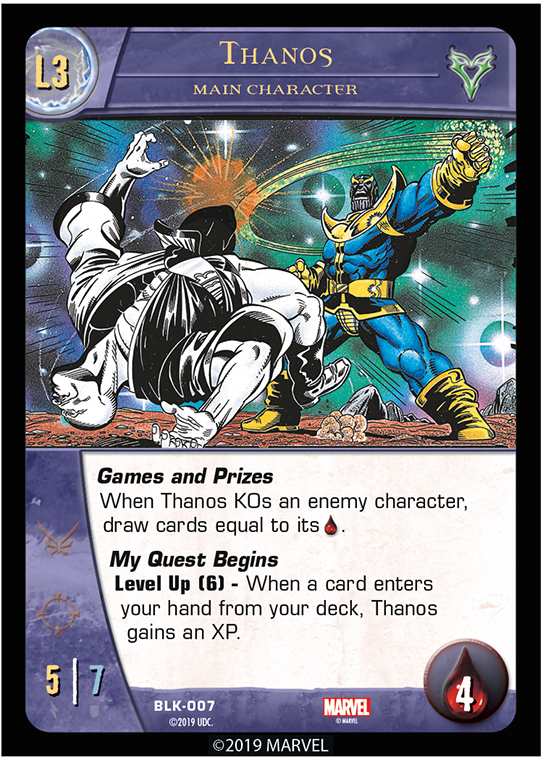 And Thanos will gain an XP for each card that enters your hand from your deck. Now let’s get to the crux of this Arc, the Gems themselves. We saw the Soul Gem already, when we saw Adam Warlock, but here it is again. 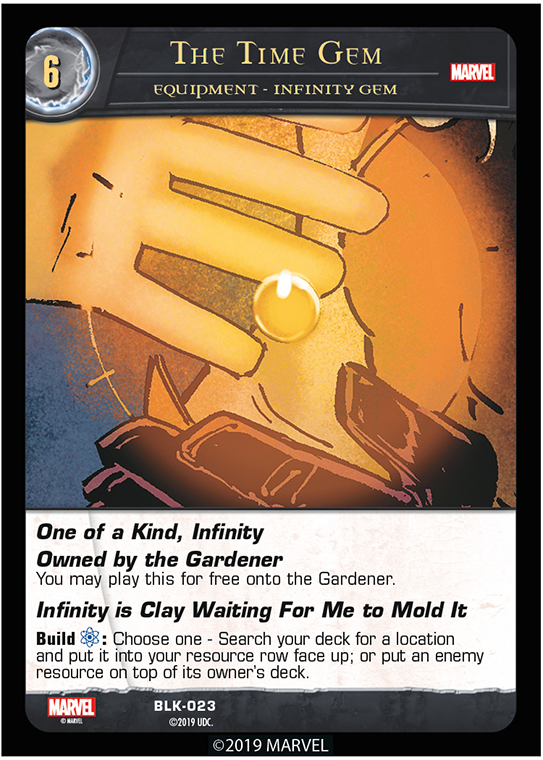 A couple bookkeeping items here we didn’t mention in the Adam preview – Infinity Gem in the type line and the Infinity keyword. 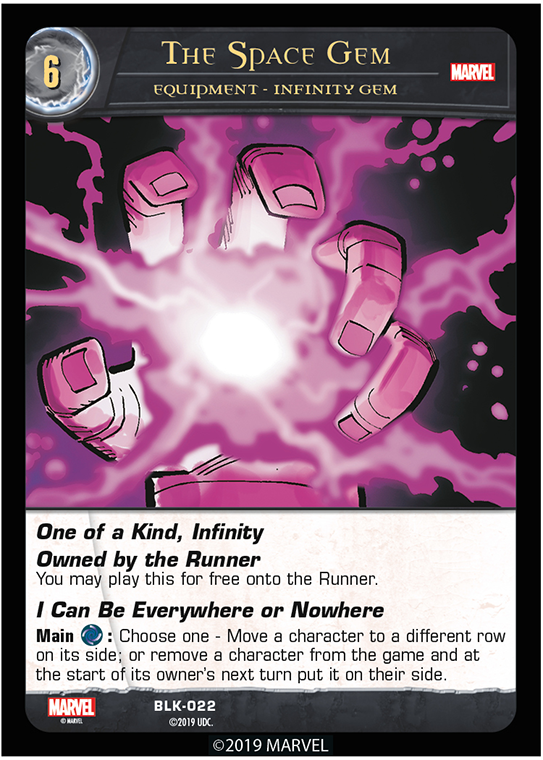 Infinity Gem is a referent, but also means something else we will get to later in this post! 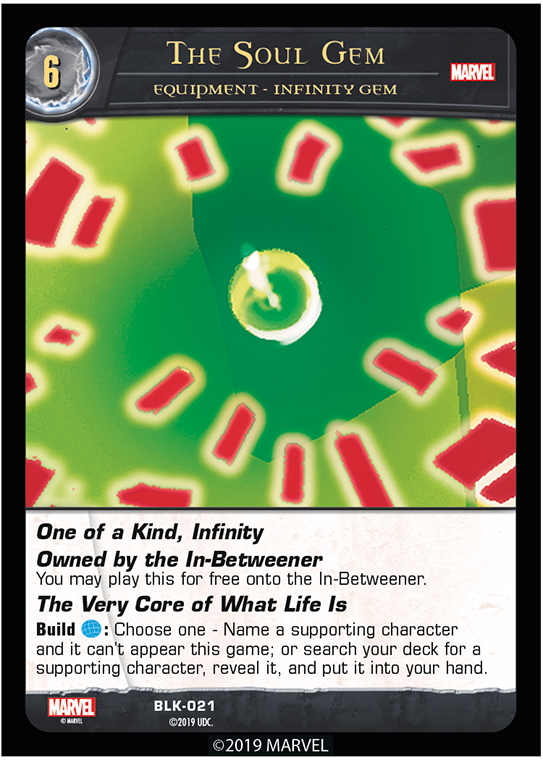 And if a card with Infinity gets put into a KO pile from anywhere, you may shuffle it into its owner’s deck. These aren’t your grandmother’s gems! Let’s get to the rest of these dual-nature items! Alright, so let’s pause here. Of course, the Reality Gem needs a tad more explanation. You can use this Gem to turn cards in play face up. If you choose a stunned character this counts as recovering it. If you choose a hidden character, it counts as un-hiding it. If you choose a face-down location, it will simply turn face up. If you choose any other type of face-down resource, it will remain face down. You can also use the Gem to turn cards in play face down. If you do this to a ready character, it counts as hiding it. If you do it to an exhausted character, it counts as dazing it (stun it but it doesn’t gain a wound). If you do it to an equipment, that equipment will stay equipped but its powers are temporarily turned off. It will turn face up again when the characters on that side would recover. If you do it to a location or other face up card in the resource row, it will simply turn face down. Hey, that one’s simpler! Now for a quick editorial. Designing the Infinity Gems and the Infinity Gauntlet was a blast! I think we were very ambitious in our design, and it started with a goal of being able to use them in multiple ways. We wanted some decks to just use a Gem or two without the Gauntlet. 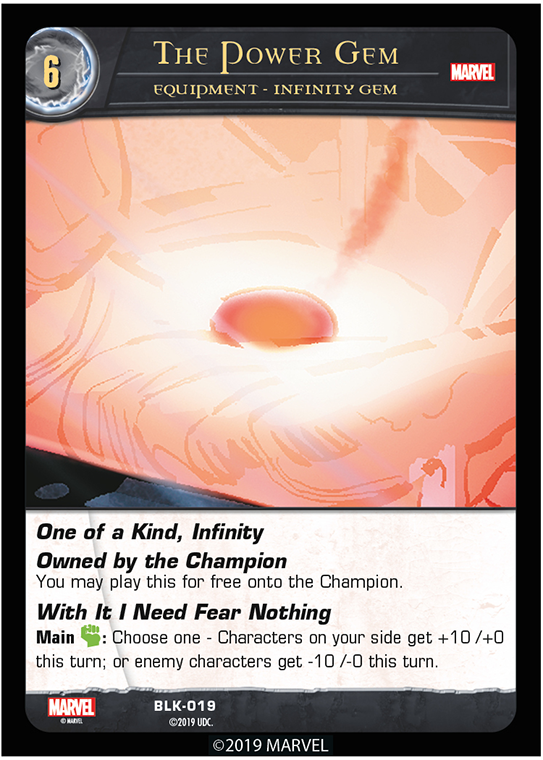 We also hope there will be some “pure” Gauntlet decks out there as well, that are trying to achieve Infinite Power! And the third way, well, we’ll get to Thanos’ Level 4 in a bit. Now if only these Gems had a home! 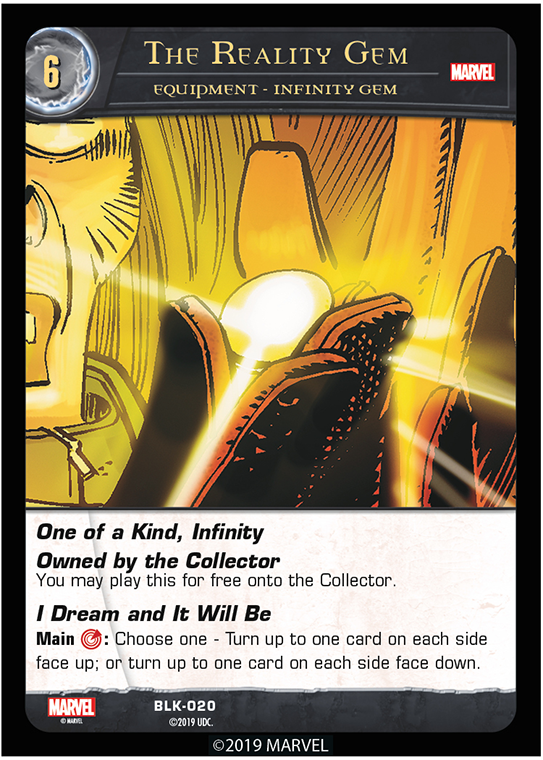 Before we get to the big stuff, here is the payoff for “Infinity Gem”. Infinity Gem equipment can be face up in your resource row, but you can only do this with the Gauntlet equipped to someone on your side. 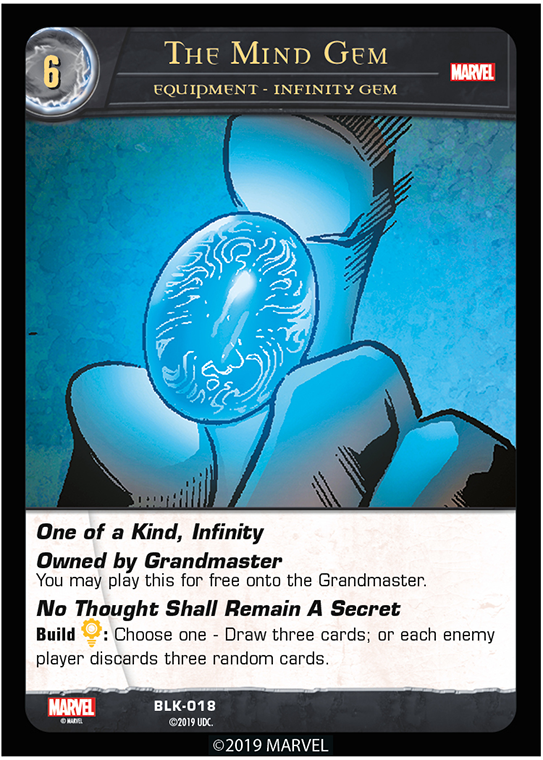 Note that the Gauntlet has the power of the inset Gems, even if you don’t have all of them…yet. If the Gauntlet leaves play, leave the face-up Gems in your resource row as they are. However, you can no longer use their powers. If a character on your side equips the Gauntlet later in the game, those Gems will already be inset, and the Gauntlet’s wielder can use their powers again. Infinite Power. Pretty good. Don’t be a jerk about it though. Don’t follow Thanos’s example. I would draw three cards instead of two at the start of my turn. Imagine! But without further ado, here is the main man. 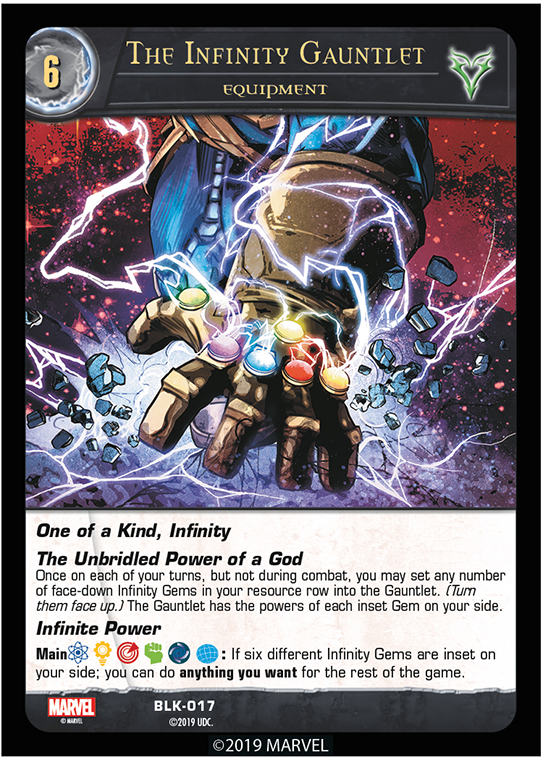 Note that when the Gauntlet is KO’d, its Infinity power will allow you to shuffle it into your deck if you’d like. Just in case you need another one. Like if you’re a bad flipper. So The Universe Will Now Be Set Right has a 50-50 chance of removing each character on each side from the game. If this removes a player’s last main character, that player loses the game. If this removes each player’s last main character (including Thanos, himself) then the Thanos player wins the game. The order you flip in doesn’t technically matter, but there are style points to be earned here. You’ll figure out the way you prefer best! And just so you know, we like to use a coin with a smiley face on one side and a very sad face on the other. Well, I was worried about writing that preview, but it was a snap! Join us next time in the utopia that is the VS. System 2PCG!